Dustwalk is an unforgiving, dead-end town. It's not the place to be poor or orphaned or female. And yet it's the only home Amani Al'Hiza has ever known - the desert is in her bones. Amani wants to move on, escape, to see the world she's heard about in campfire stories. More than a want. A need. Then a foreigner with no name turns up and saves her life. Tell me how you want your story to go, he says, and we'll write it straight across the sand. With him she has the chance to run. 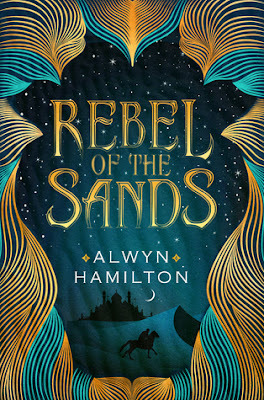 Rebel of the Sands is set to be one of the best books of 2016 and I am so excited for everyone to get their hands on it and come along for the ride. It's full of mythology, adventure, a little gunpowder and a lot of action. Seriously, the story does not stop moving and there is always something dangerous and exciting happening. Amani, the protagonist, is without a doubt the most kickass character I've ever met. She is fearless, strong and full of determination, not to mention quick-witted, intelligent and a good fighter. She was so interesting to me, as was Jin, the foreigner she meets on her journey. Minor spoiler warning here: I loved their subtle romance. It wasn't overpowering, it didn't take over the entire book, it wasn't the main plot, and it didn't follow the typical formula of boy + girl + danger = boy saving girl's life multiple times. I mean, that did happen but it worked the other way, too, which is something we don't see enough of in YA. They were equal and the attraction between them wasn't mentioned often; it was just there beneath the surface. Another aspect I enjoyed was Rebel of the Sands' relevancy to our world today. Again, very subtly, it tackled the way women and people who are simply different from us are treated. There was a bit of politics and some discussion on religion and believers/non-believers, and Hamilton did this whilst crafting an incredibly realistic, magical world with Eastern influences that I really enjoyed. Honestly, the world-building in Rebel of the Sands is first class. Even if this isn't a genre you would usually enter into, I definitely recommend picking up Rebel of the Sands and giving it a go. I did, and I'm glad because it's one of those books that pushed me out of my comfort zone and took me on an amazing journey. Rebel of the Sands is truly special and one of a kind. A lot of people have read and given this stellar reviews! I will most likely read this at some point, but with my teetering tbr, I am afraid it won't be soon. Thanks for the review and I will definitely tell readers you loved it. I absolutely loved this book! It got 5 stars from me too.